In 1978 I was 32. Chloë was 7. She was such an avid reader I couldn’t keep up with her passion for books so I decided, as a non-traditional student, to take a course in children’s literature to find out about as many books as possible that might interest her, particularly those that had been published since my own childhood. In the introductory class I was horrified to discover that, in an otherwise highly demanding academic course, one of the first assignments was to write a children’s book. A children’s book! ‘Oh, for heaven’sake,’ I thought. ‘How easy!’ I felt that the assignment was beneath me. How wrong I was. No wonder the lecturer had set the task—we all discovered how difficult it was to write for young children and our estimation of children’s authors rose sky high. It was a lesson well taught, and well learnt. In the years that I’d been reading to Chloë I’d been shocked and dismayed by the very few Australian books available for Australian children so I determined to write a very Australian book. I wrote a four and half page story called Hush the Invisible Mouse. I was lecturing at a teachers’ college at the time (Sturt College of Advanced Education) so I asked a colleague in the art department if he could recommend an illustrator. I thought that I might perhaps blind my professor to any weakness in my story by having some glorious illustrations to hand in with it. My colleague, Tom Gleghorn, suggested an ex-student of his from the Sydney Art School: Julie Vivas. It was probably the luckiest day of my life. My lecturer, Felicity Hughes, raved about my story and urged me to try to have it published. 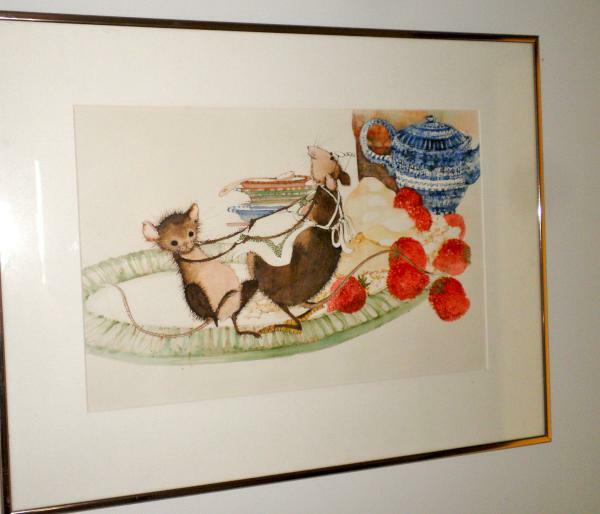 Here are two of the adorable pictures Julie did for Hush the Invisible Mouse. Is it any wonder I received a high distinction? I learned later than one should never include artwork with a manuscript: the publisher finds the illustrator in 99.9% of cases. Julie VIvas did several glorious paintings, which I sent with the story to nine different publishers over five years. Hush the Invisible Mouse was rejected nine times over those five years, which was extraordinarily discouraging, needless to say. My adoring, biased, supportive husband kept my spirits up, as did booksellers and librarians whom I knew, and they all encouraged me to try, and try again. They thought it was fabulous. The tenth publisher: Omnibus Books in Adelaide, accepted it but asked me to cut the story by two thirds, re-write it more lyrically, make it even more Australian and change the mice to a cuddly Australian animal. I chose possums. (Australian possums are very soft and cute.) Poor Julie re-did all the illustrations. The book was published early in 1983. 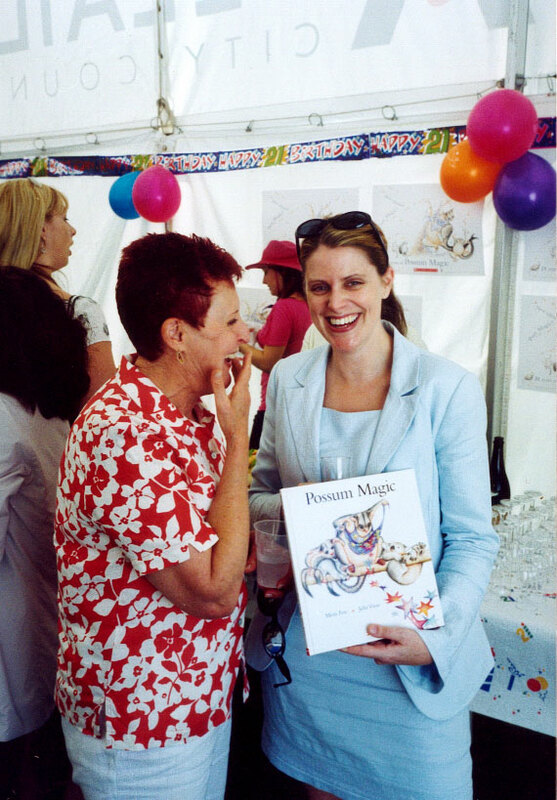 Possum Magic became and remains the best-known picture book in Australia and the best selling picture book ever in this country. It’s still in hardback, which makes it a publishing phenomenon. Most books are out of hardback and into paperback after a year. Well over a million copies were sold in its first ten years of publication—and most of those were in Australia, whose population is only 22 million. By mid-2013 its sales were almost five million. 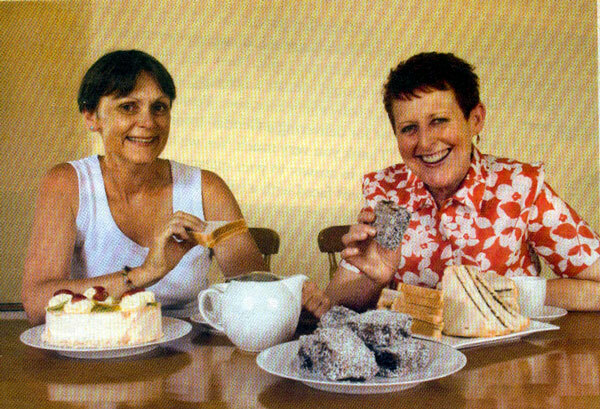 This is Julie and me in 2004, the year Possum Magic turned 21 with great fanfare. In 2004 there was a 21st birthday celebration limited edition (only 500 copies published), boxed beautifully, all signed by Julie Vivas and me. We signed copies of this edition until 3 am one morning, an occasion neither of us will ever forget: the dream had turned briefly into a ghastly nightmare! With each copy of the book itself there was/is another exquisite, ecxclusive book on the history of Possum Magic which will never be published for the trade. The collectors’ edition & the history book are inseparable parts of the same, boxed, keepsake. Unfortunately, or fortunately depending on where you’re coming from, the entire 500 were sold immediately and are now collectors’ editions, as was the intention. If they have been written on by anyone other than Julie or me they will have lost most of their value so if you’re thinking of buying one—and can find one to buy at some scary price—make sure it’s a ‘clean’ copy. 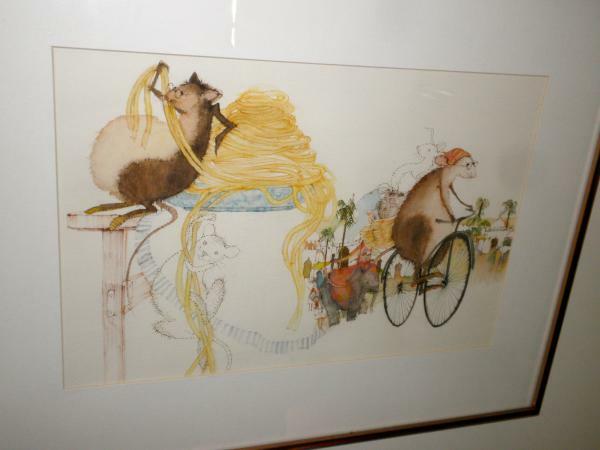 There have been many Possum Magic products over the years including height charts, birthday books, calendars, address books, bookmarks, balloons, a recipe book, and Grandma’s-brag book, etc. Most of these are no longer available. But there remains on the market a ‘plush’—a little hardback copy of Possum Magic packaged in a box with an adorable toy possum. 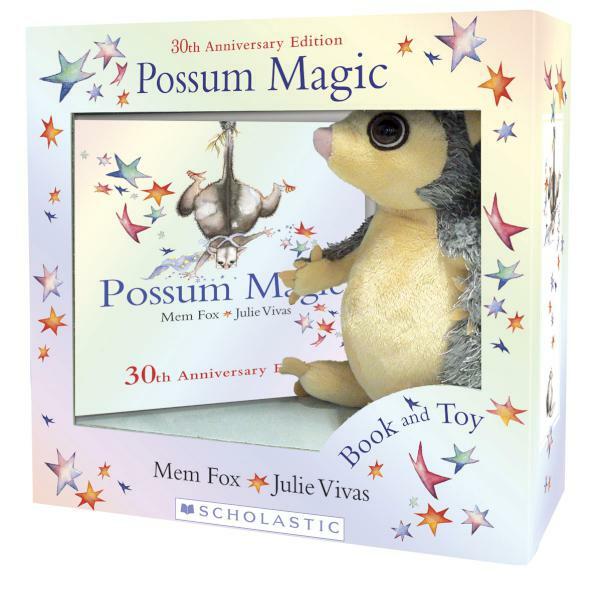 The latest version of the plush commemorates the 30th anniversary of Possum Magic this year (2013). It’s my favourite Possum Magic product ever. 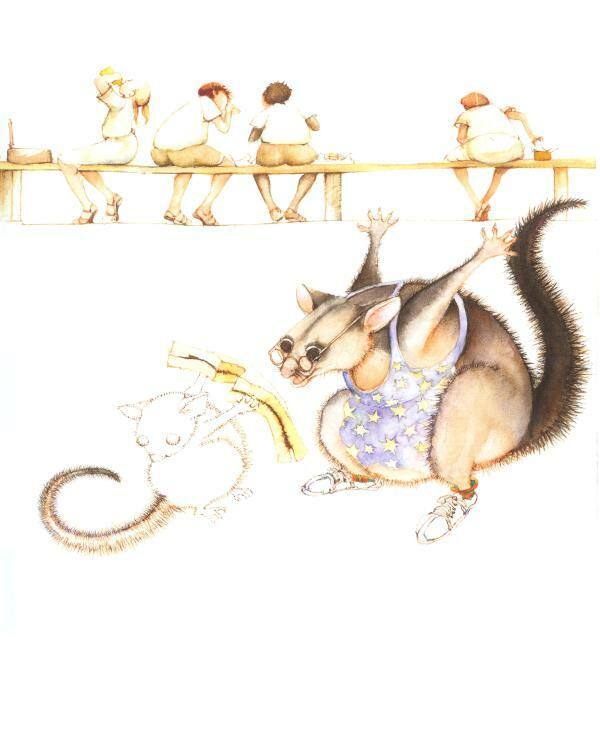 I chose possums as the main characters for this book because we had possums on our roof and the babies were adorable. I didn’t include Canberra, the national capital, because it wasn’t a state capital. I chose the casino in Hobart because it was famous at the time for being new and for being the first legal casino in Australia. I chose pumpkin scones in Brisbane (for those of you reading this outside Australia, Brisbane is the capital of the state of Queensland) because at that time the wife of the premier of Queensland was Flo Bjelke-Petersen, nationally famous for her pumpkin scones, which was an in-joke for the parents who read the book to their children. The other foods were chosen for their alliterative qualities and because they were typically Australian. I hoped I would live long enough to be able to read a book of mine to a grandchild of mine. And I have! (So has Julie Vivas.) 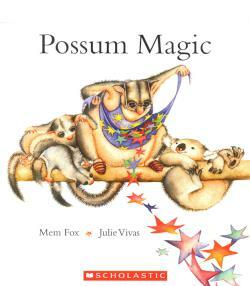 Reading Possum Magic to my scrumptious grandson has been, and will always be a surreal and, well… magical experience. Hush and Grandma Poss in Darwin, with the famous Vegemite sandwich. You will find below the recipes for the typically Australian foods in Possum Magic: ANZAC biscuits, lamingtons and pavlovas. ANZAC stands for Australian and New Zealand Allied Corps. These biscuits (ie. cookies) were sent to soldiers during the First World War. Beat whites of eggs with salt vigourously for six minutes gradually adding, as you beat, the castor sugar, vinegar and vanilla. Mixture should be stiff and able to stand in peaks. Then sift in the cornflour. Lightly wet the pavlova plate (round crockery baking plate, about 10-12 inches across) and spoon mixture on to it to make a circular mound. Gas oven: Bake for 10 mins at 200 Centigrade (400 Fahrenheit) then at Centigrade (Fahrenheit 200) for 60 mins. Electric oven: pre-heat to 200 Centigrade (400 Fahrenheit) then set at 100 Centigrade (250 Farenheit) and bake undisturbed for one and a half hours. Sift 1 kilo (2lbs) of icing sugar with 4 tablespoons of cocoa. Work in 250 grams (1/4 lb) of butter then slowly add half a cup of hot water to make it rather thin. Add half a teaspn. of vanilla. Place basin containing icing over a bowl of hot water to keep icing sort of runny. With a skewer, hold each piece of cake and ice it all over and then toss it in coconut spread on greaseproof paper. Labour intensive but worth it!